NEW YORK (AP) The NHL has suspended Winnipeg Jets defenseman Jacob Trouba for two games for an illegal check to the head of Ottawa Senators forward Mark Stone. The incident occurred at 6:42 of the third period of Winnipeg’s 3-2 win in Ottawa on Sunday. Stone had just made a pass in the Winnipeg zone when Trouba hit him with an open-ice elbow to the head. 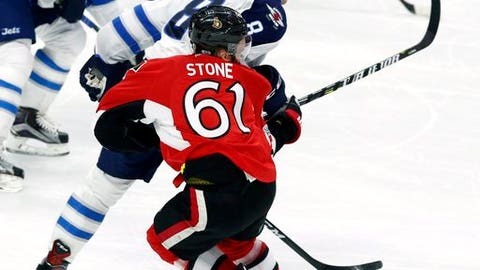 Stone did not return to the game, but has joined the Senators for their upcoming road trip. Trouba was assessed a minor penalty for illegal check to the head on the play. A first-time offender, Trouba will forfeit $33,333.34 in salary. He will miss Winnipeg’s games Tuesday in Toronto and Feb. 28 at home to Minnesota. He will be eligible to return when Winnipeg hosts St. Louis on March 3.